SAS/IML Studio runs in a Microsoft Windows operating environment, but it can communicate with SAS software running on other computers. The PC on which SAS/IML Studio runs is called the client. The computer on which the SAS System runs is called the SAS server. If the SAS System is running on the same PC that is running SAS/IML Studio, then the client and server machines are the same. There is a fundamental difference between the SAS/IML Studio graphs and the SAS/IML Studio analyses. The DataObject class, which coordinates all of the dynamically linked graphs and tables, runs on the client and keeps its data in memory on the client. Similarly, the graphs and tables run on the client. The analyses, by contrast, are performed using SAS procedures, and so the analyses run on the SAS server. 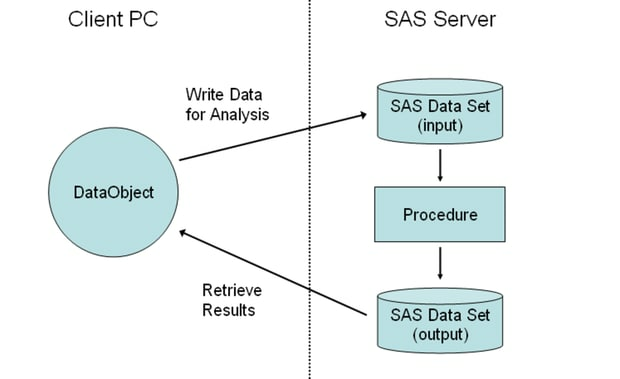 The SAS procedures must read from a SAS data set in a library on the server. To perform an analysis, you must get data out of the DataObject and write the data to a SAS data set in a server library. Similarly, after an analysis is complete, you might want to get the results (such as observation-wise statistics) out of a server data set and add them to the in-memory DataObject. Figure 1.5 illustrates this idea. Thus it is important to know how to pass data between a DataObject and SAS data sets on the server. In Chapter 2, Reading and Writing Data, you learn how to move variables between a DataObject and a server data set. You also learn how to read and write SAS data sets on the client or on the server, and how to create a DataObject from various sources of data.